In my WS you can see two more photos of the same species. Sedum eriocarpum subsp. porphyreum is a diminutive annual herb in the family Crassulaceae. It does not exceed 6 cm in height and has small, whitish flowers and succulent, usually stained reddish-purple, leaves. 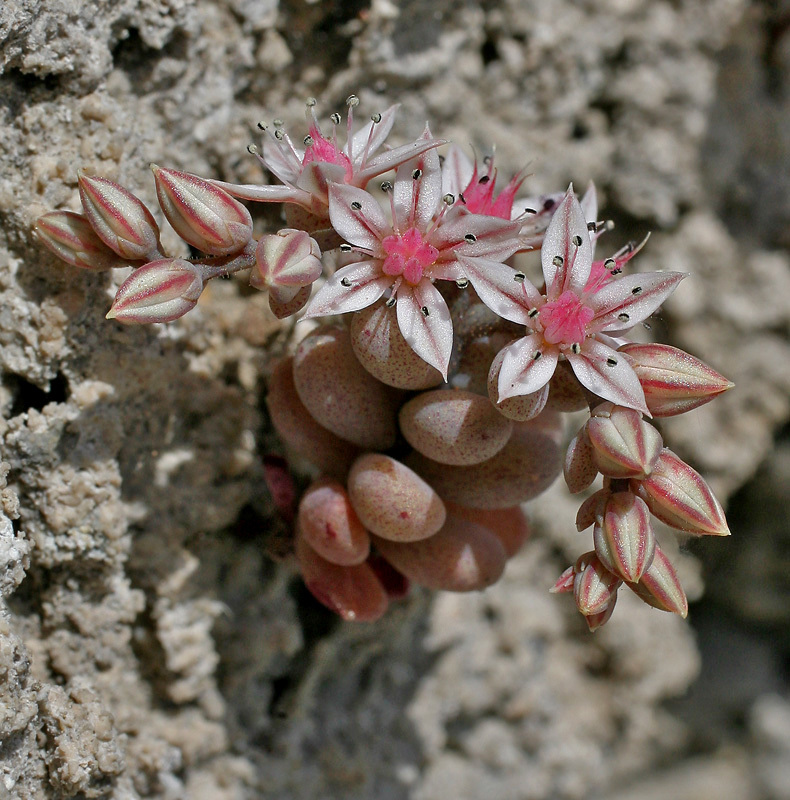 The subspecies is endemic to Cyprus and occurs in rock crevices, screes, dry rocky ground and in vernal pools from sea-level to 650 m. Flowering season: March to May. Both the main and the WS images make a fine presentation of this Cyprus endemic subspecies of Sedum. The features of the flowers and succulent leaves are shown with excellent sharpness and natural colours. Ciao Christodoulos. Lovely compo for this handsome flower taken in excellent sharp and magnificent light. TFS. How is nice this rare flower my friend! 3 beautiful pics taken whit a very impressive sharpness,light balance and magnificent colors,the best way to discover this specie so nice and so little.Thanks for share,have a nice day,Luciano. A perfect photo of this very beautiful sedum. Taken from a very good POV in great sharpness and details. Splendid natural colours and very well composed. Beautiful photo with excellent composition and fantastic colours and very good sharpness. Excellent macro of this interesting Sedum eriocarpum, great sharpness, fine details natural colors, TFS! Beautiful flowers & captured with great sharpness. Th pink color is lovely. Well done & TFS. another beautiful photo of this flowers. Great sharpness and point of view. Nice natural colours. A very beautiful macro shot of these splendid flowers, good sharpness and beautiful delicate colours, excellent POV and DOF. Well done! Bonne composition pour cette tr�s belle macro valorisant bien le sujet sous un excellent angle de prise de vue. Wonderful composition for this wildflowers. Excellent sharpness with perfect light management. Sure Nature is master, beautiful species and amazing flowers, lovely capture with fine details and colors. tfs. That photo is very interesting and original too.This flower that is unknown to me make an excellent photo. The starry flowers are very sharp and the composition well done with soft lovely colors. nice composition of these flowers, sharpness and colours are very success...best regards..
What a wonderful and strange flower, Chris! I had never seen it before. Your capture is fantastic, as usual, with splendid play of lights and shadows. The petals seem of silver! Great POV, with 3D effect. Perfect focus and superb details. How beautiful this sedum is and the flowerheads shine like little stars. There are among my favourite flowers. We have other sedum-species, but no shining like this species. Intersting composition too. This is a flower I have yet to see, so thank you for introducing it to me. You have captured it's beauty superbly in all three images Christodoulos, thank you very much for the great posting. Beautiful colour, very nice composition.